1″ Horizontal Blinds are a classic, durable, and functional product that never goes out of style. Each slat is made from 1″ wide aluminum coil stock that is roll-formed and curved an for optimal structural performance, and then cut to the width of the blind. Colour finishes include matte, textured, metallic and frosted slats, each available in a variety of colours to suit every decorating taste. 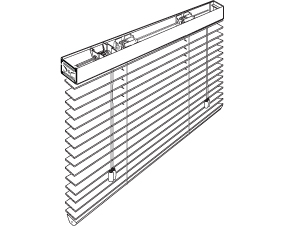 1″ Horizontal Blinds can also be ordered with a decorative valance cover. Contact us for colour options and samples.